Well, I hope you all had an excellent Christmas! Unfortunately, at this end, various bugs were having their best Christmas ever by making me ill Christmas Eve so I couldn't perform the annual feck-is-it-Xmas-already-I-must-go-out-and-buy-something ritual, made my nephew literally cough his guts up Christmas Day and now my parents, sister and brother-in-law are doing battle with the little buggers. After my bout of pneumonia back in September, which pretty much knocked me off my bike more effectively than a pothole, I figured it was about time to put my arse back in the saddle and get out of the flat for a short while. It also gave me an opportunity to try out the new gloves given to me by @RIDESURFCOFFEE and @milomoo81 for Christmas. As I am sure any guy with a love of Marvel would have done, the first thought that went through my head upon seeing these was "Spiderman!". 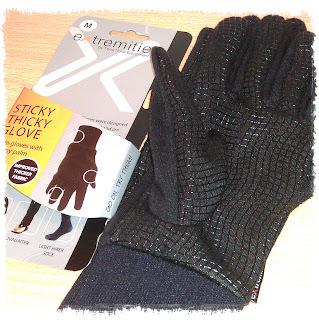 Granted, black isn't the colour of our favourite web-slinger but it was the sticky grid over the gloves that triggered the thought and which led, ultimately, to my slipping them on and pretending to climb the bedroom wall. Who wouldn't?!?! Come on, don't tell me you wouldn't be the tiniest bit curious to try it out!! So, the gloves themselves are the Sticky Thicky Gloves under the extremities brand available through Terra Nova Equipment. After nearly freezing my fingers off with just my standard Nike running gloves back in late Summer, I decided to use these as a base layer to those gloves, as I figured it would be nice to reduce the likelihood of bits dropping off as it got cold; it would make my work as a programmer a lot harder if all I could do was mash the keyboard with my knuckles. Wearing the two layers was a good call, too, as the wind was biting when I first set out and the rain quite heavy but my little mitts kept warm the whole way and, had I decided to make the effort, I could easily have gesticulated to the woman who cleverly pulled out in front of me without looking. But I didn't. I'm nice like that.